GetLinked® Software Forum • View topic - My chart of accounts has changed. Do I need to update the chart of accounts in GETLinked Software? My chart of accounts has changed. Do I need to update the chart of accounts in GETLinked Software? Post subject: My chart of accounts has changed. Do I need to update the chart of accounts in GETLinked Software? Yes, you will need to update the chart of accounts in GETLinked Software. It is a fairly simple, but important process. GETLinked Software validates all account numbers you enter in transactions against the account numbers you created in the GETLinked Software Master Account Number list. This helps avoid invalid account number issues during the Transfer process. If you removed account numbers from your accounting system you may want to delete the existing chart of accounts from GETLinked Software. To do that go to Setup > System > Accounts and click the “Delete ALL Accounts” button. You can also delete accounts individually by selecting them with the account number lookup and then hitting the “Delete” button. The exact steps for importing the new chart of accounts are different for each accounting system but the general process is the same. 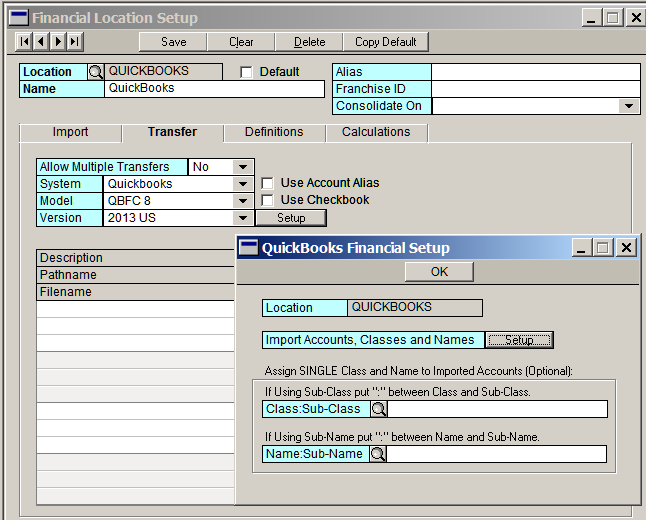 The chart of accounts comes from the Transfer system in GETLinked Software. 1. Open the Financial Location setup window by going to Setup > POSLink > Location. 2. Select the location that was changed and click on the Transfer tab. 3. Click the Setup button to the right of the Version dropdowns. 4. Make sure you have your QuickBooks company file open. 5. Click the Setup button next to Import Accounts, Classes and Names. Once the import completes you should get a message indicating how many accounts were imported or if there were any errors. QuickBooks uses a direct connection to the company data file, but other accounting systems may ask you to point to a chart of accounts export file. Consult your accounting system documentation for help creating the chart of accounts export file as needed.